Melbourne hosted reigning premiers Adelaide at Casey Fields, an impending low-pressure system looked likely to thwart our heroines again. But it appears that Mother Nature is a Dees fan. As the ball was tossed, the fans who went on pilgrimage to the Fields of Casey were prepared for anything. They wore shorts and singlets but also toted raincoats, hats and umbrellas. The wind swirled around the centre square like a ballroom dancer and ominous clouds loomed centimetres above ruck Erin Hoare’s head. The Demons won the first ruck tap sending the ball to Karen Paxman and into the arms of Alyssa Mifsud at the Mr Whippy end of the ground. A behind got the scoreboard warmed up for what would be a big day for the giant numerals. Still missing all-Australian duo Erin Phillips and Courtney Cramey, the Crows were determined and displayed some impressive scrapping. Newbies Ruth Wallace and Eloise Jones managed to find space in places where you cannot swing a cat while Chelsea Randall tried to ignite the Crows with her Wonder Woman skills. 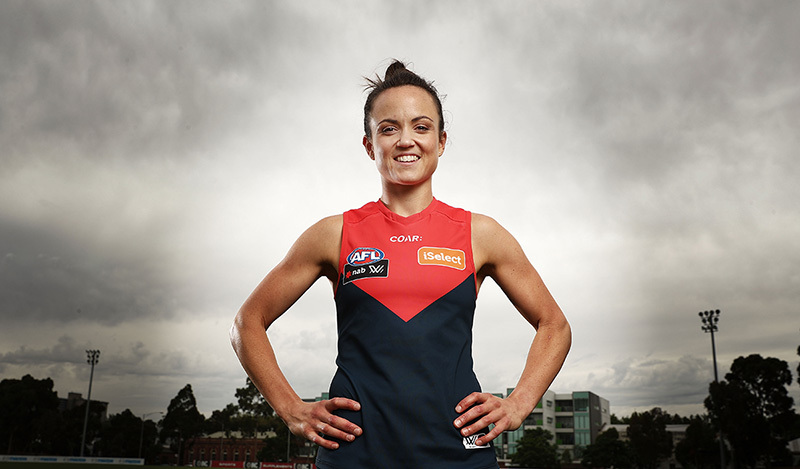 But the first quarter would belong to Melbourne’s Aliesha Newman. Taking the ball near the centre square, she burned off her opponent, kicking a goal that had the crowd squealing and mobile phones beeping with “OMG did you see that”. Newman’s goal surely qualifies her for Goal of the Year, and potentially for the 100 metres in the Commonwealth Games. In a game that had more buns than Bakers Delight, it was a braided Abbey Holmes who claimed the Crows’ first goal. Richelle “Rocky” Cranston showed off her athleticism and poker face as she cleared the ball through the centre, looking to the left while handballing to the right. The Crows’ second quarter plan was to use the heavy wind advantage to hit the scoreboard. But it was the Demons who capitalised, as they faced the elements head on with the fierceness of Beyonce looking down the barrel of a wind machine. Melbourne’s Pearce, Paxman, O’Dea and Hickey turned the pressure up to eleven, proving they are the Beatles of midfields. While Adelaide’s Jasmin Hewett converted an impressive mark into her first AFLW goal, the Demons’ structures looked as sharp and stylish as Rebecca Judd’s Insta posts during Spring Racing Carnival. When Tegan Cunningham kicked the Dees’ fourth goal for the quarter Bruno Mars sang out from the PA system “Don’t believe me just watch”. It sounded like a warning to the Crows and a potential bumper sticker for Melbourne’s 2018 campaign. Melbourne went into half time 20 points up, moving as cohesively as a school of fish. The Crows had their chins up and belief in their eyes as they jogged into the rooms ready for half time oranges. As the third term commenced, storm chasers were left disappointed as the skies cleared. A Mel Hickey kick from 50 metres out received a nudge from the wind, the ball seemly grew wings like a Golden Snitch in a Potter book and flew through the big sticks. The players celebrated like it was 1999 and kids hung over the fence slapping the advertising boards like it was 1979. The Crows looked as perplexed as tourists who accidently found themselves in Dandenong, instead of Mount Dandenong. You can only imagine Erin Phillips, who was confined to the red plastic seats on the sidelines, must have been, desperate to be tagged in to help out her team. The Allan sisters played their role for the Crows in defence. Which reminds me, mark round five in your diary when Sarah and Jess Allan face off with Carlton sisters Sarah and Jess Hosking. I expect such a contest will create a hole in the space time continuum which will see Kylie and Danni reprise their 1986 Young Talent Time duet of “Sisters Are Doin’ It For Themselves”. Deep in the third quarter, Crow Jess Sedunary tucked the ball under her arm and tried to weave some magic. Her efforts were thwarted, but the footy Gods rewarded the Crows’ effort with a goal moments later for Ruth Wallace. But for every card the Crows played, the Dees had a stack of Draw Four Wild cards. When Newman kicked her second goal a declaration of “UNO” seemed to be whispered on the wind. The Demons retained control of the game in the final term. They missed some scoring opportunities, but their cogs in the engine room Lily Mithen, Bianca Jakobsson, Katherine Smith and Daisy Pearce ignored the memos from their lactic acid and just kept running. A goal for Adelaide delivered by Jenna McCormick was like 7/11 flowers bought at 10pm on Valentine’s Day, too little too late. The Crows, who will now look to Bec Goddard for some whiteboard magic to salvage their season. 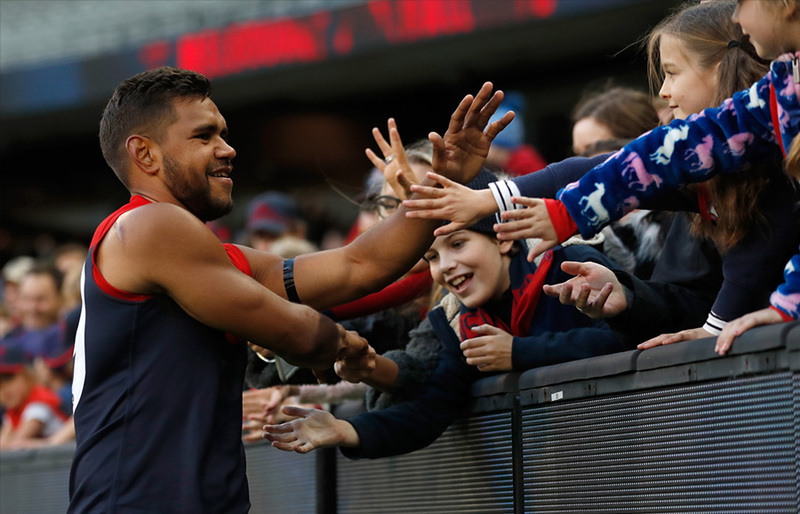 With a 32-point win, the Demons mouth guards shone through broad smiles. As the players sang the song, the home crowd waved their Grand Old Flags. Pressed up to the fence for selfies and high fives. Melissa Hickey was grinning in the change rooms as she ripped tape from her ankles and with a twinkle in her eye offered a footnote to our chat, “Keep your eye on the red and the blue”. Brought to you by iSelect, proudly supporting the groundbreakers.